Whilst there is some dispute(1) about exactly where the adductor canal block should be performed, there is no doubt that the aim is to block the saphenous nerve above the knee(2,3). 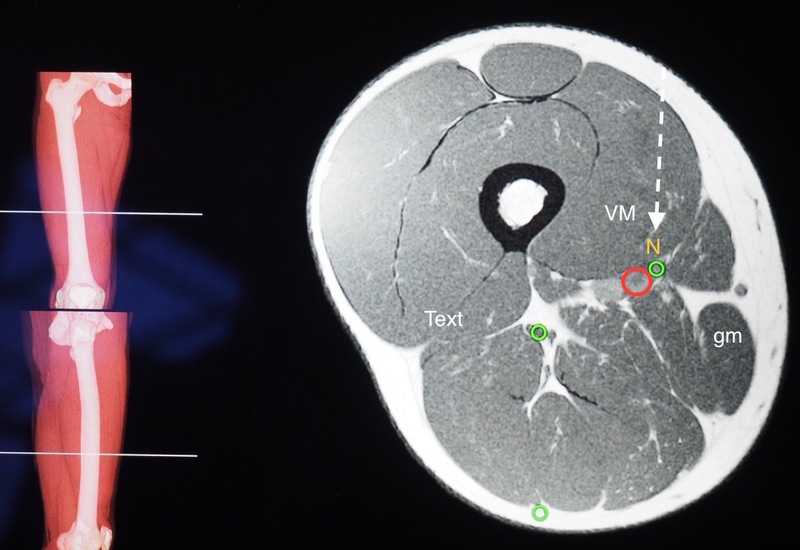 The block also blocks the nerve to vastus medialis which also innervates the knee(4). It has been called a subsartorial block, a distal femoral block and usually includes inadvertent blockade of the nerve to vastus medialis. It has become popular as a way to provide some analgesia to the knee following anterior cruciate reconstruction(2,5) and total knee arthroplasty, as an alternative to the femoral nerve block(6). Whilst there is some reduction in quadriceps strength, it allows mobility with lesser risk of falls(7,8), and has mostly replaced the femoral nerve block to allow early ambulation. The block may also be used to help patients with severe pain after medial meniscetomy. Catheter insertion to prolong block duration has been shown to be beneficial after local infiltration analgesia (LIA) for knee arthroplasty. The saphenous branch of the femoral nerve descends in the thigh alongside the femoral artery. This provides a convenient landmark and makes this a perivascular block. As the nerve descends it lies on the anterolateral side of the artery as they pass under the Sartorius muscle, and vaso-adductor membrane. In the distal thigh the femoral artery and saphenous nerve exit the adductor canal and as they do so they separate. The saphenous nerve moves superficially between the vastus medialis and Sartorius muscle whilst the femoral artery dives deeper towards the adductor hiatus between the vastus medialis and adductor magnus(4). 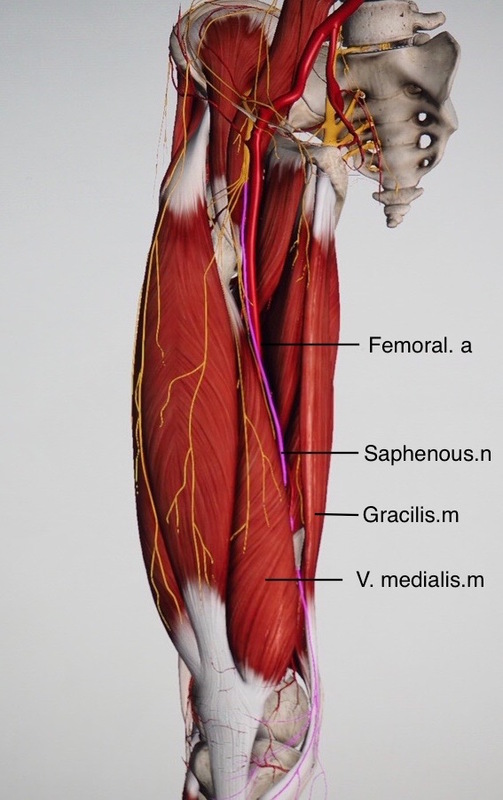 The image below shows the thigh with the sartorius muscle removed.The block is performed in the mid to lower thigh (between labels for saphenous. n and gracilis muscle). Patient positioned supine with the leg externally rotated. A linear probe is placed over the medial thigh 10-12cm above the patella. The femoral artery is identified lying between the vastus medialis and adductor magnus. Overlying this is the Sartorius muscle, triangular in shape and more echogenic than the other muscles The femoral vein lies deep to the artery. The infrapatellar branch of the saphenous nerve which supplies skin on the medial side of the leg below the patella can be recognized by following the descending branch of the superior geniculate artery (DBSGA) in the lower thigh as it leaves the femoral artery although this is not always present. A needle is introduced in-plane towards the femoral artery passing through the vastus medialis muscle to lie on the antero-lateral side of the femoral artery. Small injections of LA are used to confirm needle placement in the perivascular space, and aspiration excluding intra-vascular placement. 10ml-20ml of local anaesthetic is administered ensuring spread around the artery. If a catheter is to be inserted, the probe is rotated to 45 degrees to transverse and a tuohy needle imaged into position with the tip facing the transducer. The needle is then rotated so the tip faced caudally. A 5ml test injection opens the space and a perineural catheter inserted 3-5cm beyond the needle tip. After total knee arthroplasty the catheter can be topped up every 8hrs with 8-10ml of Ropivacaine 0.2% or an infusion at 4 ml/hr. The major risk of this block is intravascular injection leading to LAST. 1. Bendtsen TF, Moriggl B, Chan V, Pedersen EM, Børglum J. Redefining the adductor canal block. Regional Anaesthesia and Pain Medicine. 2014 Sep;39(5):442–3. 2. Espelund M, Grevstad U, JAEGER P, Hölmich P, Kjeldsen L, MATHIESEN O, et al. Adductor canal blockade for moderate to severe pain after arthroscopic knee surgery: a randomized controlled trial. Acta Anaesthesiologica Scandinavica. 2014 Nov;58(10):1220–7. 3. LUND J, JENSTRUP MT, JAEGER P, SØRENSEN AM, DAHL JB. Continuous adductor-canal-blockade for adjuvant post-operative analgesia after major knee surgery: preliminary results. Acta Anaesthesiologica Scandinavica. 2010 Oct 29;55(1):14–9. 4. Burckett-St Laurant D, Peng P, Girón Arango L, Niazi AU, Chan VWS, Agur A, et al. The Nerves of the Adductor Canal and the Innervation of the Knee: An Anatomic Study. Regional Anaesthesia and Pain Medicine. 2016 May;41(3):321–7. 5. Hanson NA, Derby RE, Auyong DB, Salinas FV, Delucca C, Nagy R, et al. Ultrasound-guided adductor canal block for arthroscopic medial meniscectomy: a randomized, double-blind trial. Can J Anaesth. 2013 Sep;60(9):874–80. 6. Memtsoudis SG, Yoo D, Stundner O, Danninger T, Ma Y, Poultsides L, et al. Subsartorial adductor canal vs femoral nerve block for analgesia after total knee replacement. Int Orthop. Springer Berlin Heidelberg; 2015 Apr;39(4):673–80. 7. Grevstad U, MATHIESEN O, Lind T, DAHL JB. Effect of adductor canal block on pain in patients with severe pain after total knee arthroplasty: a randomized study with individual patient analysis. British Journal of Anaesthesia. 2014 May;112(5):912–9.